Hello my friends. I just returned from my last business trip of the year. Ahhh. (If you want to read more about my year of book promotion, Dianne Jacobs invited me to write a post for Will Write For Food.) I closed my office door for the week and I’m taking a little time off. It’s one of my favorite weeks, just getting ready for Thanksgiving, nesting and digging into books I’ve been wanting to cook. I’ve loved every bit of this book, from the charming introduction to the glossary of grains, and the beautiful photography. Every recipe is clear and well written. I made Porridge in Pink with Raspberries and Greek Yogurt and the Farro Pasta Cacio e Pepe, that last one more than once. 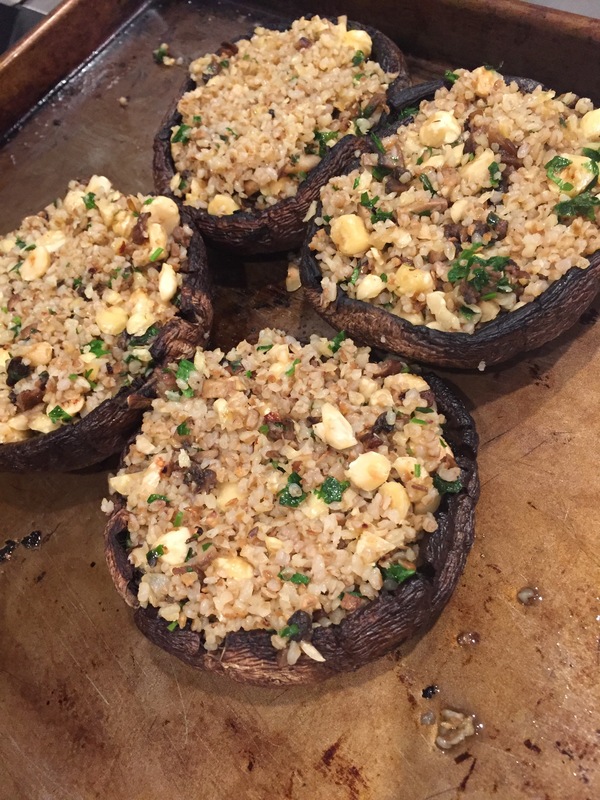 But it’s Roasted Portobello Mushrooms with Hazelnut Buckwheat Stuffing that you need to know about now. It is perfect fall food. Woodsy and cheesy and filling. 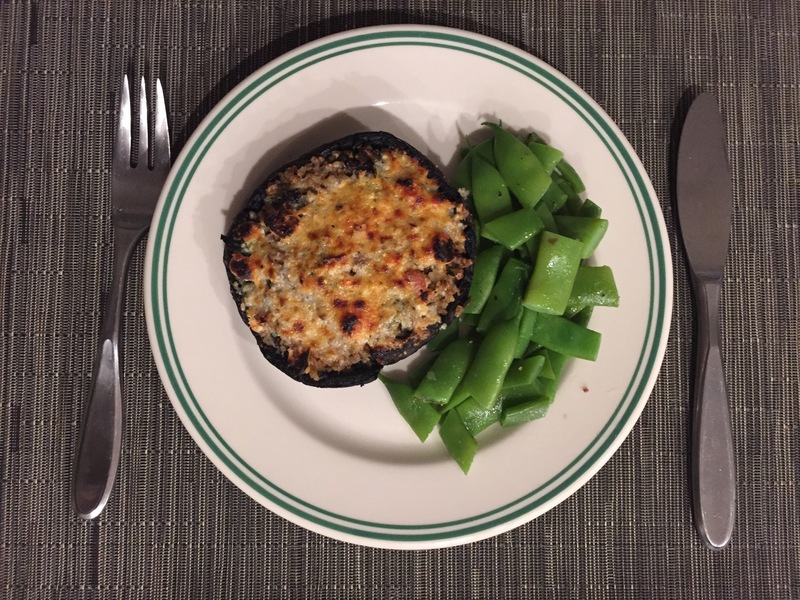 We enjoyed it as a satisfying and easy to make meatless supper served with Roma beans stashed in the freezer last July and oh so delicious in November. Another time, I garnished mine with pancetta. It’s a flexitarian’s dream, this recipe. The tidied portobello (I like to remove the gills before stuffing. Use the side of a soup spoon to gently scrape them away.) 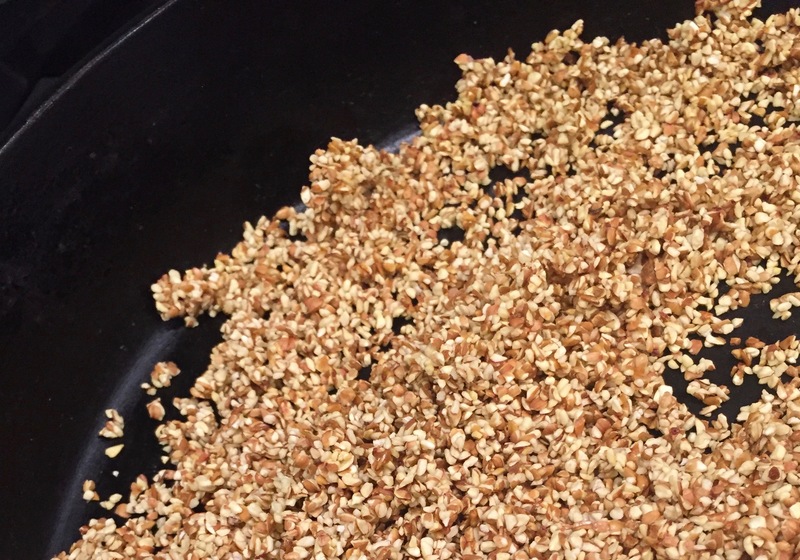 is stuffed with hazelnuts and buckwheat, in this case, kasha, which is roasted groats. It’s gluten free and, not related to wheat at all! My grandmother served me kasha as a child and it brings back great memories. Once I had a pot of kasha in the fridge and ready to eat, we enjoyed it warmed at breakfast with an egg and fashioned into a grain salad at lunch. And that’s really the essence of Maria’s book. It’s what to do with the grains in your kitchen, how to to introduce them into your everyday eating, and what to do with those grains once they’re in the fridge. I love this book. You’ll want it in your kitchen, too. Place a rack about 6 inches away from the heat and preheat the broiler on high for about 5 minutes. Grease a large rimmed baking sheet with olive oil or cooking spray. Remove the stems of the mushrooms, slicing close to the base (reserve for another use such as in a broth or vegetable stir-fry). Rub the mushrooms, inside and out, with 2 tablespoons of the olive oil. Season generously with salt and pepper. 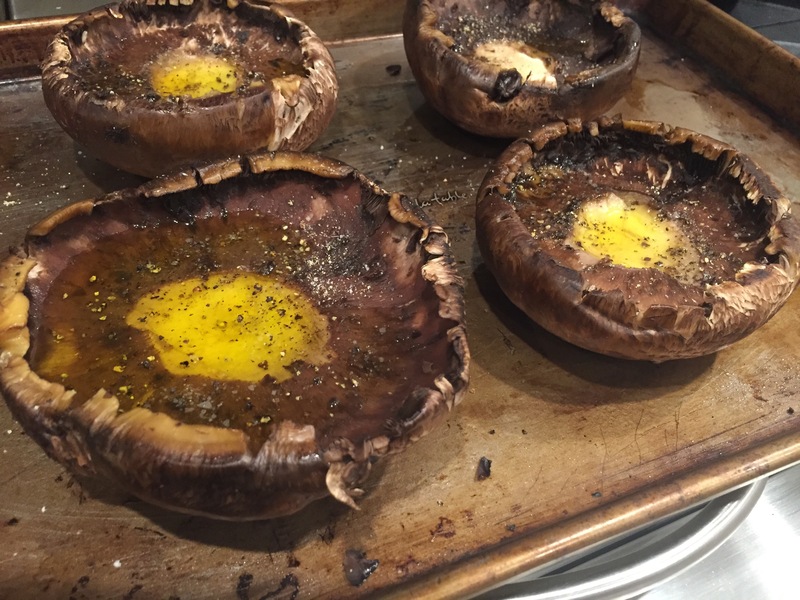 Place the mushrooms, gill side up, on the baking sheet and broil for 5 minutes (7 minutes for thick mushrooms). Meanwhile, add the kasha, hazelnuts, garlic, thyme, Aleppo pepper, and salt to a medium bowl. Drizzle with the remaining 1 tablespoon olive oil and stir with a fork to combine well. Season the stuffing with salt to taste. 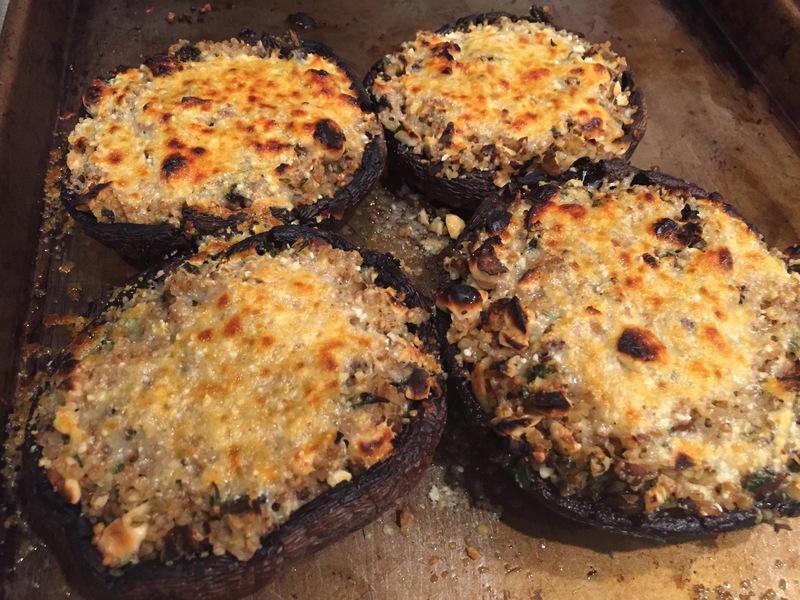 Remove the baking sheet with the mushrooms and carefully heap about 1⁄4 cup of the buckwheat filling into the center of each mushroom. Spread the filling with the back of a spoon, gently pressing it down. Sprinkle the Parmesan across the top. 5 minutes more, watching closely so as not to burn the Parmesan (this can happen within 30 seconds—I’ve been there!). To finish, remove the baking sheet. Loosely fold a slice of prosciutto and immediately place it into the center of a stuffed mushroom so the residual heat can soften it. Repeat with the remaining prosciutto. Garnish each mushroom with a twig of thyme, drizzle with balsamic vinegar, and grind a bit of black pepper on top. Serve right away. FINE POINTS Large portobello mushrooms are key here so you have enough room for the filling. VEGETARIAN Omit the prosciutto and double the amount of Parmesan. Get the book. 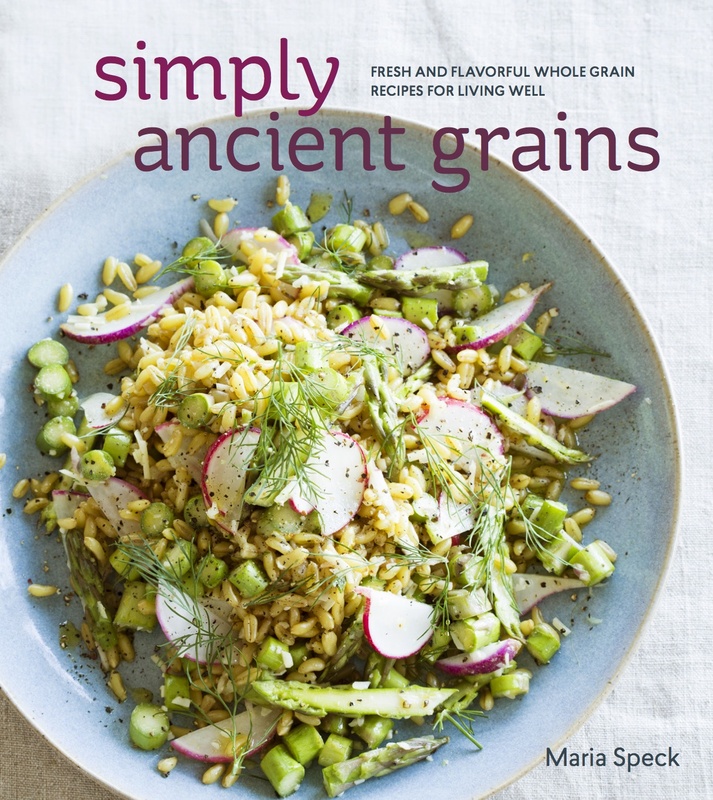 Maria Speck’s Simply Ancient Grains, Ten Speed Press. 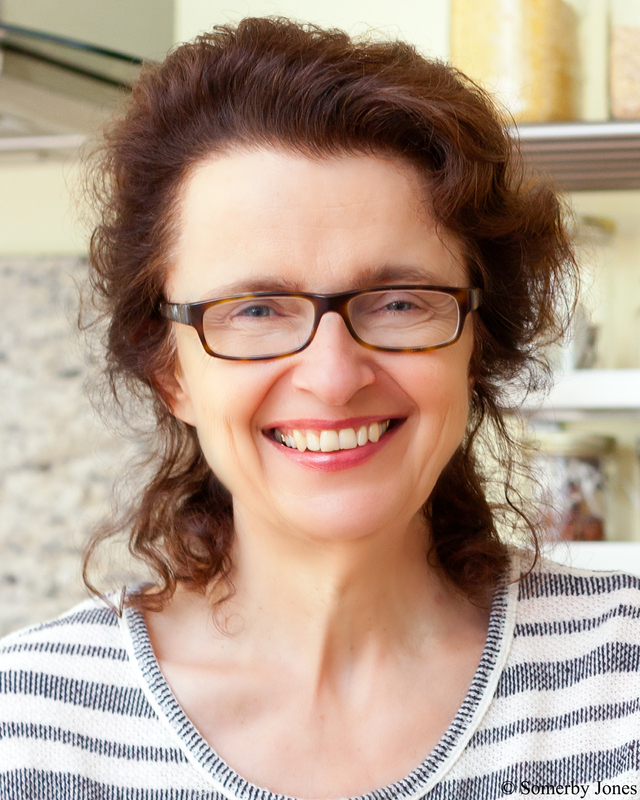 Maria Speck is a food journalist and author of the multiple award-winning Ancient Grains for Modern Meals, including the coveted Julia Child Award and a Gourmand Award. She has contributed to Gourmet, Saveur, Gastronomica, and the Vegetarian Times. Maria was raised in Greece and Germany, two cultures with centuries-old grain traditions that have inspired her passion, and are the foundation of her cooking. She lives in Cambridge, MA. in season. gooseberry pectin and raspberry violette preserves.